Hope for Reforming Government in Polarized Times? Prez to Press: Is Reorganizing Government ‘Extraordinarily Boring’? The Trump administration’s bid to streamline agency operations bumped up against the human factor on Thursday as the Social Security Administration’s quiet plan to close a suburban Washington field office provoked a demonstration. Some 60-70 mostly union protesters gathered in front of the Social Security Office in Arlington, Va., chanting “Not no, but hell no!” in response to the plan to shutter the decades-old office by June 21. The motive for the closing, according to top American Federation of Government Employees officials, is pressure from the White House and budget director Mick Mulvaney’s April 2017 guidance asking agencies to propose ways to streamline and consolidate operations for greater efficiency. Asked for comment, SSA spokeswoman Nicole Tiggemann told Government Executive that “Social Security will consolidate its Arlington, Va., office, located at 1401 Wilson Blvd., with other local offices, due to an expiring lease. The landlord was not interested in renewing the lease, and [the General Services Administration] has been unable to find suitable replacement space.” She added that residents living in the Arlington service area may conduct business at any Social Security office, including offices in Alexandria, Fairfax and the District of Columbia. But that explanation was challenged by protestors and by Rep. Don Beyer, D-Va., who on May 1 wrote to acting SSA Inspector General Gail Stallworth Stone seeking an investigation to determine whether the SSA’s decision to close its Arlington office complied with legal requirements. “Closure of this office will cause my constituents to suffer from the lack of in-person services, especially to a Metro accessible office,” Beyer continued. Neither Beyer nor the speakers at the rally accepted the SSA’s explanation that it couldn’t reach a deal with the landlord, Monday Properties. A spokesman for GSA, which works with SSA on building space, on Thursday told Government Executive he could not answer the questions and to contact the SSA. A spokeswoman for landlord Monday Properties did not respond to inquiries. Speakers at the rally stressed that 10,000 Americans every day are turning 65, and cutting access to field offices is tantamount to cutting a benefit that recipients have paid for. SSA since 2010 has closed 64 field offices, according to the advocacy group Social Security Works. The group cited polls showing that 84 percent of Americans oppose office closures. Since 2010, SSA has cut administrative expenses by 10 percent and reduced its workforce by 3,500 employees. The trend began after President George W. Bush attempted to privatize parts of Social Security, said Witold Skwierczynski, president of the AFGE’s National Council of Social Security Administration Field Operations Locals. Also closed in recent years were 533 part-time “contact stations” intended as outreach efforts, he added. Field offices were recently closed in Chicago and Milwaukee, and one in Baltimore is scheduled to shut down in June, he noted. Many of them are in high-minority neighborhoods, he said. Nor is SSA following its own guidelines for considering a consolidation, he said, citing the need to weigh standard demographic metrics, the impact on the community, a 180-day notice requirement and a transition plan. 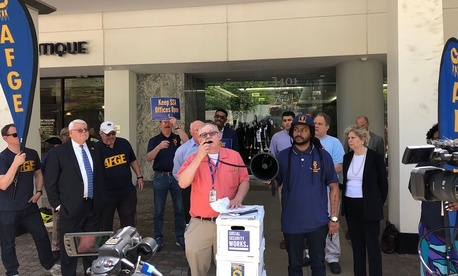 Kris Kramer, the first vice president of AFGE local 1923, which represents the workers in Arlington, said SSA had told her that the landlord wanted to do something different, but that no one will talk about GSA’s approach. Though the Trump administration had proposed a small cut in the SSA’s nearly $13 billion operating budget, the omnibus budget bill passed in March gave the agency a $480 million hike, much of it for information technology modernization and reducing the backlog of disability hearings.